Does anyone know how to help a kid whose mom is too tightly wound? Poor EJ – I know I thought up this activity and all, but I have a serious problem with mess. 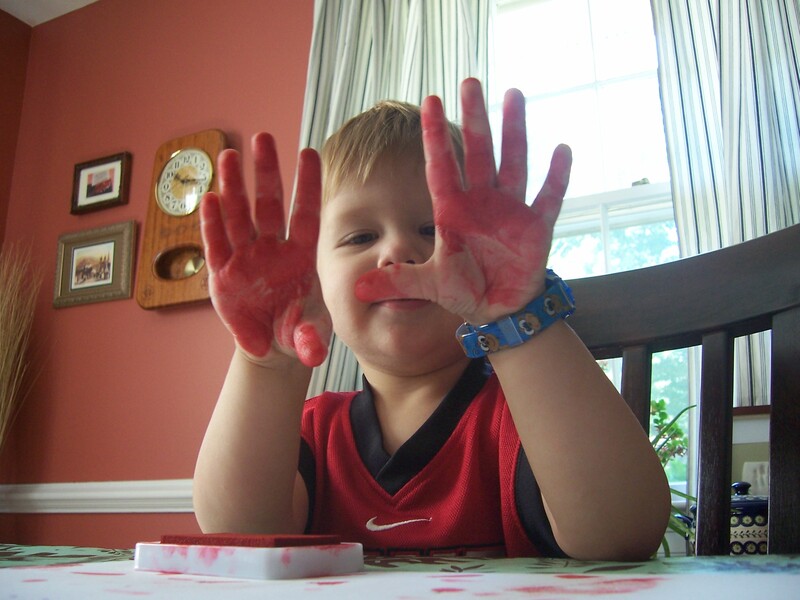 I need to loosen up and understand that if I let a toddler have his way with an ink pad, things are going to get messy. See? So EJ went crazy with his red stamp pad and his fingers and hands, and as he stamped away, I asked him what words started with A. As he named them off, I tried to find fingerprints on the paper that matched what he said. To be honest, I was mostly thinking about red ants and apples – but EJ was pretty creative with his A words! So here was our final product. I also had him do some stamping on a smaller piece of paper so my mom can hang it on her fridge. She is so excited about having things to hang on her fridge, so I thought we’d start with this one. Yesterday was a really hectic day for us, so I pulled out some Abooks from our shelves and we read them together throughout the day. EJ’s favorite was Ananse’s Feast – an Ashanti Tale, retold by Tololwa M. Mollel. EJ’s really into spiders and turtles right now, and the main character, Ananse, is a spider – the turtle’s name is Akye. So there were A‘s all over the book! Tomorrow, I’m thinking we’ll play outside for a while and try to take some pictures of the ants that have invaded our yard. I’ll let you know how that goes… pray we don’t find any biting ants! Oh, I’m jealous! I love this one! !